Here is the next set of scrapbook pages from my Sunshine Garden Scrapbook In a Day class (pages 4-5). Start with a 6x6 piece of green paper. 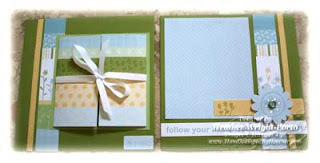 Adhere one of the border stickers vertically, as well as a 1 inch piece of decorative designer series paper. Adhere a 4-1/4 and 4-1/4 square of a light green piece of paper. Then, the hidden picture place holder. This is made from a 10 x 4 piece of decorative designer series paper, scorded at 2", 6", and 8". Tie a piece of white ribbon around the panel, then adhere to the light green square mat. Adhere sticker to bottom, right. Start with a 6x6 dark green piece of paper from the Kit. Add the light blue photo mat (3-1/2 x 4-1/2). Layer border stickers and other stickers in the pattern shown above. The decocrative piece of designer series paper is not a sticker, but a 1x6 piece of paper. Lastly, place a Rhinestone Brad thru the center of one of the blue/white flowers from the available stickers. Then use Dimensionals to raise it off the paper when adhering. More fun pages to come!